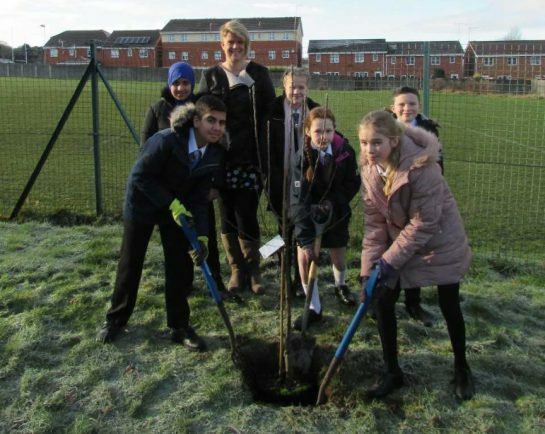 Pupils plant the tree at Birchensale Middle School watched by teacher Melanie Vaughan. HOLOCAUST Memorial Day was marked at Birchensale Middle School with its annual planting of a fruit tree in their remembrance garden. This year an apple tree was chosen for 2019 as part of a ceremony to which sees a different fruit tree planted each year by Year 7 pupils, due to its symbolism in the Jewish faith: the spread of its branches and its fruits depicting Jewish lives. Head of Humanities KS3 Melanie Vaughan also used the lessons created by Holocaust Educational Trust with all the tutor groups in the school, so everyone has an awareness of the impact of the Holocaust. This year it involved pupils writing and sending individual postcards to Renee Bornstein who is a Holocaust survivor who lives in Manchester.